But things are changing rapidly. Web Sockets introduced in HTML5 provides us a capability to create a full duplex channel over web. 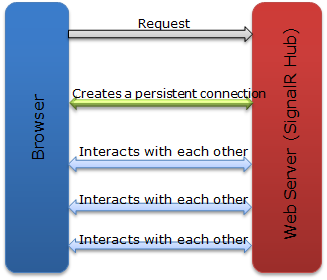 But SignalR provides an abstraction over persistent connection. It makes you tension free about the type of browser and web server versions.It works in a consistent way in all the environment. So I think you all must have got an Idea the way SignalR works. but let’s try to dig into it. 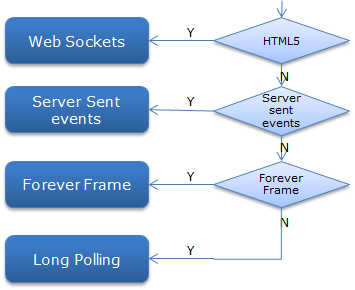 As you can see in the pic, it starts from top to bottom as if the environment supports Web Sockets else server sent event else forever frame else polling, means it has fall back one step further until your browser supports it. So in simple words, What is ASP.NET SignalR? Push Approach – Server pushes the data to all the connected Clients. So let’s see How it works pictorially? As you can see in the above pic the An event generator generates event and notifies to SignalR hub. 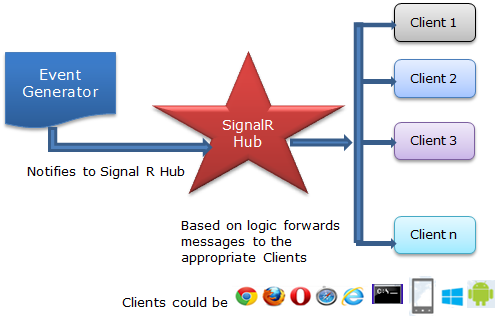 Signal R Hub process it and forwards the the message to the appropriate Client(s). You also can see that Client could be any like any .NET windows, web, console client, WP, Windows store apps, Android etc. Similarly, event generator could be any Client initiates notification on some logic, database, any other server based on some logic. You can imagine the reach and simplicity of it. And I can assure you that it is very fast as well. So what are the main components of ASP.NET SignalR? You can install SignalR via Nuget. I’ll let you know, How to install it. First, let me tell you, that to work on it, you need to have either VS 2010 SP1 or VS 2012. You can also install the SignalR sample using the following NuGet package..
Hope you all got have basic Idea about SignalR and the way it works. 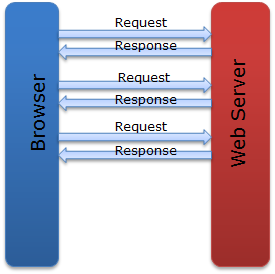 In my next post, I’ll be discussing one example and show, How does SignalR works on various browsers and environment? 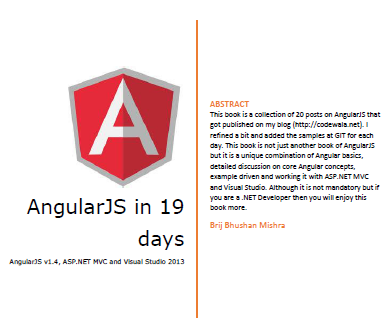 This entry was posted in SignalR and tagged .NET, ASP.NET, HUB, SignalR. Bookmark the permalink. Hello, I think the order is incorrect. AFAIK, the long polling is the last resort it tries. I messed it up while making the picture. Thanks for pointing it out. I have updated it accordingly. can you pz tell me how can i use SignalR in Studio 2010. i have installed it but i cant found option to create hub?